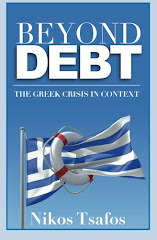 In 2010, the Greek banking sector was confronted with the following challenges (among others): (a) increased dependence on European Central Bank (ECB) funding; (b) a steady fall in deposits; (c) a steady increase in non-performing loans; (d) an inability to grow credit; (e) a deteriorating loan-to-deposit position. 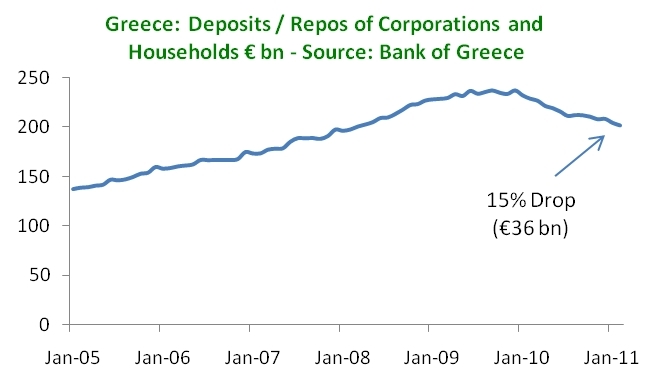 In this post, I want to review how Greek banks have fared on those five counts. ECB Funding. 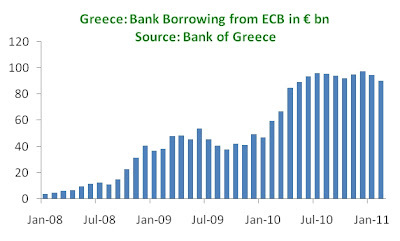 Since Greek banks started to borrow heavily from the ECB in early 2010, the markets have looked at ECB borrowing as a proxy for the banks’ ability to tap capital markets. In theory, banks would turn to the ECB only when they could not secure other funding. In practice, there was a big jump in ECB funding until July 2010, but since then this window has been stable with minimal month-on-month variation. This is good news, but it only signals stabilization, not increased health. Non-Performing Loans (NPLs). The share of NPLs has doubled from 5% in 2008 to 10% in September 2010, and so far, the trend is uniformly in one direction (worse). The deterioration in the loan portfolio comes from across the board: housing NPLs have less than doubled from 5.3% to 9.7% in the same period; consumer loans have performed even worse with an increase in NPLs from 8.2% to 18.4%. Meanwhile, business NPLs have doubled from 4.3% to 8.5%. At the same time, write-offs have not increased substantially. However, the source of write-offs has changed: while consumer loans used to account for 13% of write-offs in 2004-2005, they accounted for 68% in 2010. Corporate write-offs meanwhile have fallen. Given that NPLs have increased for both consumer and business loans, the lack of write-offs in business loans could signal a future increase in write-offs as NPLs are written off completely. Inability to grow credit. From double digit growth in 2006-2008, private sector credit grew 4.1% in 2009 and was flat in 2010. 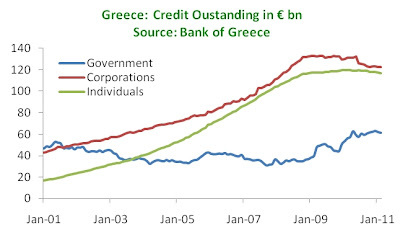 Whatever credit is extended is limited to the public sector, where credit grew by 28.6% in 2010, driven by purchases of government securities. Looking more closely at private sector credit, there has been an effective plateau to corporate credit since late 2008, while credit to individuals grew marginally in 2009. 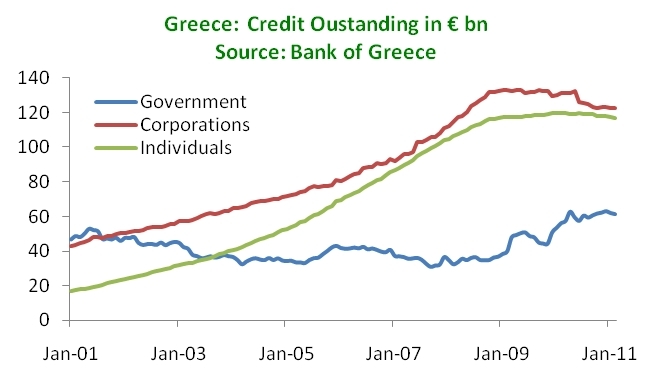 Starting in mid-2010, credit to both business and individual has fallen steadily. Deteriorating loan-to-deposit (LTD) position. Stagnant credit growth and deposit reductions have led to a weaker LTD position. The Bank of Greece publishes complete data irregularly but the latest data point, for September 2010, shows the banks’ LTD ratio to have reached 114.4% from 106.6% in December 2009. Looking back at the past few months, we can conclude: (a) ECB lending has stabilized but has not fallen yet; (b) deposits continue to drop, but 2H 2010 saw a smaller decrease than 1H 2010; (c) NPLs have effectively doubled from December 2009 to September 2010, while limited write-offs in business loans suggest more defaults are likely; (d) from flat credit in 2010, the more recent months have seen credit to the private sector contract, while the public sector still receives funding; and (e) the LTD coverage for Greek banks is getting worse. Ask a loan modification attorney and they will tell you that Greek Banks will have to undergo bail out from the European Union.